The Estoril Golf Club has suffered some changes since its inception in 1929. It first existed as a nine hole course and was later enlarged in 1945 to its present eighteen holes. This course has many times in the past hosted the Portuguese Open. 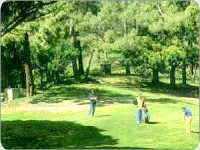 In 1997 the Portuguese Ladies Open was also played on this course. In the 90´s it suffered a further change due to the land needed for the construction of a nearby motorway. The sixteenth hole was subject to the most redesign and was reborn as a 184 metre par-3. Regardless of these alterations it is now considered by many players as one of the most outstanding hole to play in Portugal. Introduced within the 18 hole main course there is a further nine-holes designed mainly for beginners of the game.